Make-up smudges, hair dye stains and strings of starry-eyed text messages: Gillian Greer reviews Bea Roberts’ version of Flaubert’s Madame Bovary. Infinity Pool at the BAC. Photo: Gavin Smart. Modernity loves packages. Everything about the way our society is structured delights in shoving us into little boxes based on the most arbitrary information: the images on our Instagram feed, the ads we respond to, the clothes we wear, the food we eat. The data strewn behind us as we battle through the world is followed like breadcrumbs, as advertisers and employers and potential lovers try to cobble together some idea of the person it all adds up to. Infinity Pool, Bea Roberts’ take on Flaubert’s classic Madame Bovary, deconstructs its characters in much the same way. 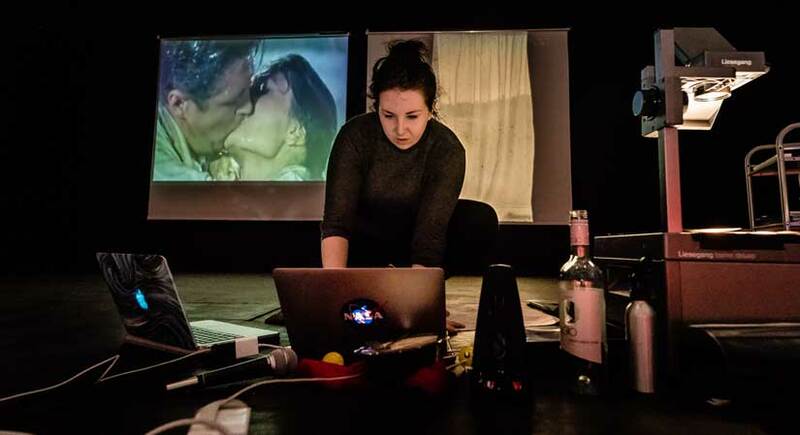 Rather than presenting our protagonist, Emma, in the flesh on stage, Roberts builds her world through still images, browser tabs, microwaved meals and typed conversations. It’s a fragmentary approach that somehow feels more tender and vulnerable than any traditional characterisation might do. There’s something intensely personal about the things you Google alone at night, or the fantasies you scroll through when you really should be responding to your office emails. Throughout the course of an hour, Roberts crafts a delicate and textured world for Emma to inhabit: a dull trading estate job, a mirthless marriage and a whip smart woman with few opportunities to exhibit her shine, while Roberts herself deftly weaves her way through the material onstage, somewhere between an archivist and a conductor. The images she renders are beautifully specific – I never thought before seeing this play that someone could be perfectly described as ‘very Comic Sans’ – while also purposefully opaque: Emma’s insecurity about her ‘fat hips’, for example, can’t be quantified against a female body onstage. The absence of her feels defiant: It’s impossible to escape the idea that Emma, if played by an actress, would lose some of her control here. That women are constantly evaluated, quantified and processed based on their bodies is an inescapable reality, so here Roberts has just taken the constant out of the equation. By removing Emma from the picture, she becomes more real, less easily boxed off as one kind of woman or another. We’re forced to examine the breadcrumbs, engage with her words and her actions rather than with the physical manifestation of her. And it works! What follows is a tender, if impossible love story, built from make-up smudges, hair dye stains and strings of starry-eyed text messages. Simultaneously poignant and vibrant, it’s an experience that pushes the limits of the stories theatre can tell, and quietly breaks your heart in the process. Infinity Pool was on at the Battersea Arts Centre. Click here for more details.